What are they for, how to add and delete them and add artwork. What do I use the Shows page for? The Shows page is a way for you to track information that corresponds to each competition/exhibition you've entered. You can record information including Pieces Submitted, Submission Deadline, Pieces Accepted, Competition Date, Notification Date, and Awards. Click Shows in the left side menu, then click the gray New button. Under the Show Type drop-down select Competition. Enter the rest of the information you’d like to include. Then click Save. Note: If you don’t see the Location you’d like to add for the Competition, click New Location. 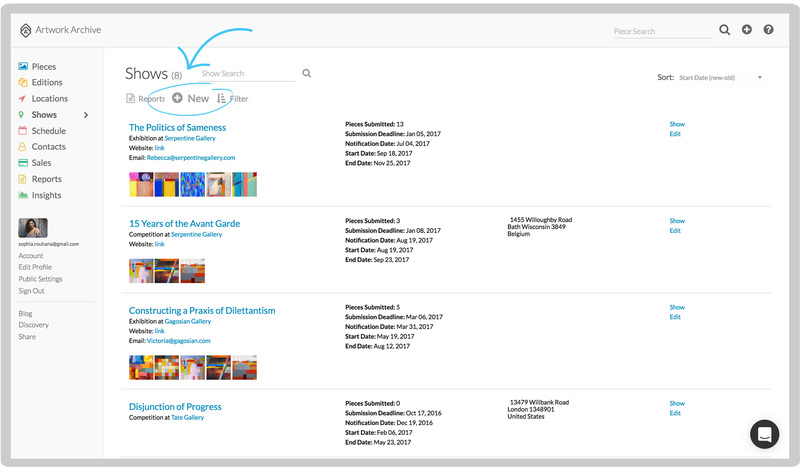 If you have just created a new competition or exhibition, click the gray Assign Pieces button. If you are adding Pieces to a Competition you made earlier, click Shows in the left-hand menu, then scroll down and click the competition name. Then, click the gray Assign Pieces button. 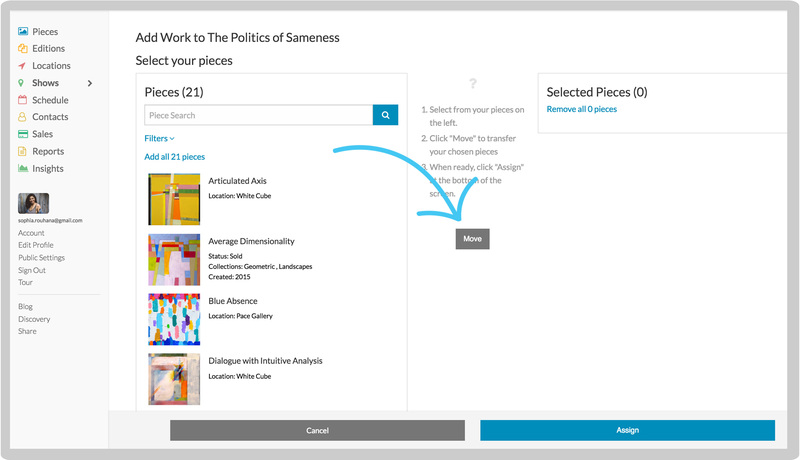 Select your pieces and click the Move button to add them to your Selected Pieces. Once you’ve added the pieces you want to include, click the blue Assign button to add them to your Competition Record. Note: To add Pieces to a Competition Record, the Pieces must have been added to your Artwork Archive Inventory first. Click Shows in the left side menu. Then click Edit to the right of the competition or exhibition you wish to delete. Click the red trash can button at the bottom of the page. The deletion is permanent, but the Pieces associated with the Competition will not be deleted.